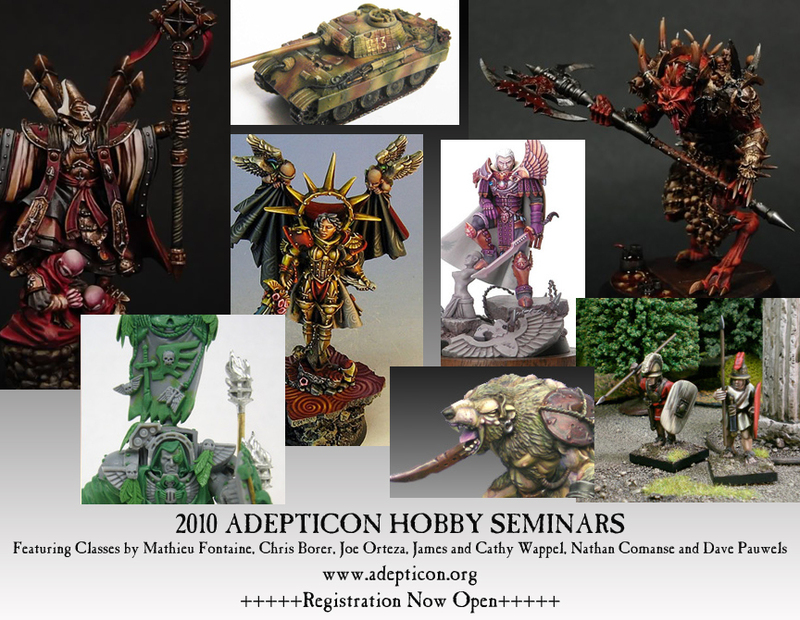 Adepticon 2010 is rolling out a strong line up of hobby seminars. Top of the line instructor are available to help take your hobby skills to the next level. Be sure to register early, the most popular seminars sell out early. The Hirst Arts terrain seminar will be returning. I always have fun teaching this class – the seminar is all hands on and very approachable. Rest asured, I am no Golden Demon winner – working with Hirst molds is a skill anyone can learn. A re-do on the Etruscan Captain picture, the face should actually be visiable this time. Also posted are pics of the 2nd class spear men from Gorgon. The figures are easy to prep, with just a bit of drilling needed to open the spear hand. A few of the figure angles are a bit odd, with one leaning way back and one leaning far forward. I know some folks like action in their figures, but I could do with smaller angles. After musing on using the Etruscans in the WAB Ancient Greek List, I’m having a second thought. Instead (or additionally), I may them under the Republican Roman list as Italian forces fighting in the Roman manipular style. Not 100% how to pull that off, but its an idea I’m kicking around. Republican Rome Army Project – Wargames Factory birthed a thousand Roman armies from their $9.99 sale. I picked up 3 boxes – 150 Romans should be more than enough for any project. The army list below will be used as an opposition force to my Carthage army. Its not 100% legal, lacking a 2nd Hastatus unit, but its primarily intended to be used on the demo table. If I should chose to play the army, I’ll convert the Italian Spearmen into Hastatus to meet the army list requirements. Pectorale – 22.5 cm square bronze chest plate. Inexpensive armor option, pre-dating mail. Muscle cuirass – archeological evidence of use into the 1st century BC. None – light gear increasingly worn by Hastati in the years following the Marian reforms 105BC. Plume vs. Feathers: various sources are giving contradictory information about head gear. A reference to the Altar of Domitius Ahenobarbus indicates Republican soldures wearing plumes from the time of the Punic Wars up to the time of Ceasar. Cavalry: Polybuis notes that the cavalry were armed in his day in ‘Greek fashion’ (i.e. with linen corslets, strong circular shields and long spears), but he observes that perhaps up to 190BC they had lacked body armour & carried only a short thrusting spear and a light shield. Colors: Crests could be white, red or black. Tunics could be white, sand or red. Shields red or white. Servian Constitution – 580-530BC. Established the 5 class system and introduces Hoplite style of warfare. Maniples Reform – 390-340BC. Wars with Gauls and Samnites motivate a change from phalanx to Maniple sub-units. Marian Reforms – 105BC. End of the Maniple system. Standardized equipment for all members of the legion. Figures are WarGames Factory Romans combined with Numidians. Metal shields from Gorgon, wire spears from On Military Matters.